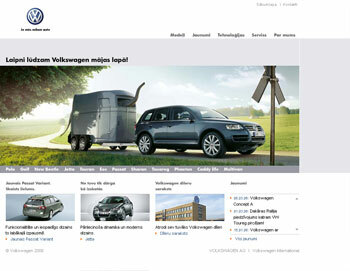 Internet is the core platform for Volkswagen’s brand communication and dialogue with its customers. It unveils the world of Volkswagen, makes people dream and lets them experience Volkswagen in its deepest sense. 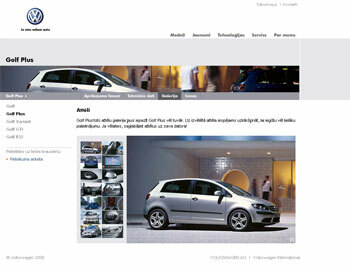 To guarantee the utmost pleasure, all latest technological achievements have been used on Volkswagen’s website. Flash, video, sound, a 360 degree interior and exterior show, photo galleries. Despite the advanced technologies, the site is intuitive and easy to use. Bear in mind that this site is an advert that does not look like one – it’s witty, emotional, simple, and it addresses everyone. This is the world of Volkswagen – exciting, dynamic, full of events and magic. The very structure of the website is simple but smart. Choose the model you want to look at. Read more about technologies, service, or apply for test drives. Find out what’s new in the world of cars. All possibilities are there, right in front of you – on the screen. Technology and design are united to make a perfect, integrated whole. Get pleasure out of the visual, the static and the dynamic. So far you have been marvelling at Volkswagens outdoors – now you can do it online. 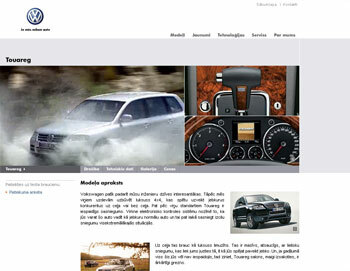 The website has been developed according to Volkswagen’s corporate standards and is as the brand itself – technological and state-of-the-art.